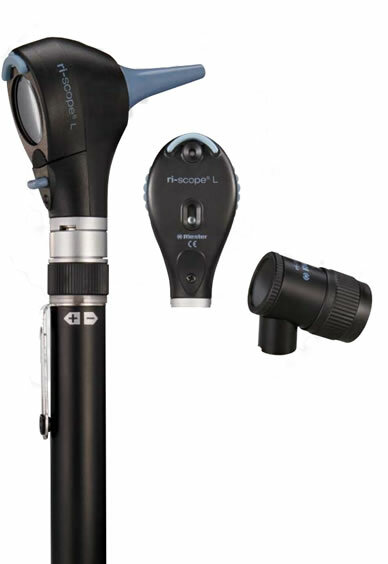 The ri-scope® L opens a new era of high-performance and user-friendly diagnostic instruments. Li-ions/LED technology and new high-performance instruments signiﬁcantly reduce costs while improving both effectiveness and reliability. Essentially improved optics and functions of the instrument. LED illumination – Bright, white light with a nearly unlimited lifetime. With its monochromatic white light (reference color temperature = 5.500° Kelvin) the lamp in the ri-scope® L provides cold light and true-color, even illumination of the area under examination. Lamps with LED technology have a lifetime of at least 10,000 hours (compared to 20-30 hours with halogen and Xenon lamps) and are extremely energy-efﬁcient. LED illumination is available with all Riester E.N.T. instruments and ri-derma® with lithium batteries or Li-ion batteries with alternative handles, Types C or AA.